It is all fine if your wheelchair drives over a nice polished kitchen floor. But this is not all that life has to offer. You will want to go outside and negotiate pavements which have not been looked after for some time. You may want to go for a walk in a park, forest or garden. And your powerchair should be prepared for it! 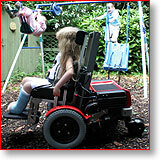 Dragonmobility powerchairs have been designed with independent three-point elastomeric suspension. Each of the front wheels has a separate suspension block. And the back transom bar on which the castors are mounted has combined redistributed suspension with high shock absorption to make your ride smoother . The whole system benefits from the self-damping nature of elastomeric suspension making it unnecessary to use additional shock absorbers.